At this time of year it’s easy to reminisce of Days of Awe gone by spent at both Beth-El Congregation and Ahavath Sholom. Always members of both congregations, as a young child we mostly went to Beth-El. My folks, TJP editors and publishers Rene and Jimmy Wisch’s first apartment was across the street from Beth El’s Broadway location in what is now a parking lot. Mom and dad always enjoyed the Reform services and made many friends, through chavurahs in the early years. Yearly, without fail, we would rush to “the Temple” for Erev Rosh Hashanah services after being overstuffed with soup, brisket, stuffed cabbage and the like. We were a big crew and had the reputation of being late, it seems our seats in the balcony were reserved just for us and was that Rabbi Schur, of blessed memory, taking note of our entrance? Our days were usually spent at Ahavath Shalom, “the shul.” Mystery of mysteries, we weren’t on time there either, and relegated to the back of the sanctuary in the folding chairs. It was a full house and our entrance didn’t seem to be noticed as the back of the house was somewhat chatty. Abe “Abela” Friedling was always on hand to pass out some candy to the kids when we got bored. And, when I returned in later years with my own children, Herbie Berkowitz, also of blessed memory, picked up the baton and passed out Tootsie Pops to my own brood. Those were the days. I watched as families grew, shrank and grew again. I felt at home at the Temple and the Shul and will forever hold memories of High Holidays at both houses of worship near and dear to my heart. How amazing it is that now in addition to the Temple and the Shul, one can worship at Chabad of Fort Worth, Chabad of Arlington, Congregation Beth Israel and Congregation Beth Shalom in Tarrant County. Regardless of where you hang your kippah, here’s “Wisching” all of the TJP readers and their families a Happy and Healthy New Year. May you be inscribed! Everyone looks forward to Fort Worth’s best kept secret every year, the Jewish Person of the Year. 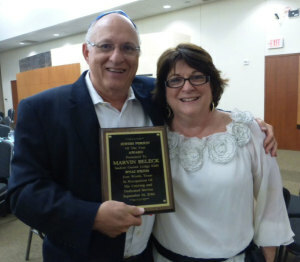 Nobody was more surprised than Jewish Person of the Year committee member and the honoree himself Marvin Beleck. “I was totally shocked and honored to receive this award and to be listed in future lists with such great Jewish community leaders as all past recipients who won,” said Marvin in an email to the TJP. Dr. Carole Rogers, last year’s honoree, read Marvin’s “reveal” speech. Known for his volunteerism in the Jewish community and community at large, his huge heart and his can do attitude. Marvin is a native Texan who was born in Greenville and grew up in Tyler. He’s a foodie, and specializes in the Texas favorites of grilling, smoking meats, making barbecue sauces and canning fruits, vegetables and pickles. Congratulations to Marvin, his wife Ava and the entire Beleck family for this distinguished honor. Thanks Sharon for mentioning Dad and remembering his “Poo-Poo Pops” as our kids called them! You brought tears to my eyes. I loved going to Shul for the holidays. I do miss going to Fort Worth.